and someone else... smashes everything! A new world is about to arise. A horde of GodZ are battling to be the most powerful deity of the pantheon: Will you play the role of Tud, God of Mountains and Mud? Or will you dwell in the ocean bottom with Glu, God of the Seas and Fried Fish? Whichever god you are going to incarnate, you will lay the foundations for your brand new cult, creating life, building villages and commanding your mighty Avatar amongst mortals. 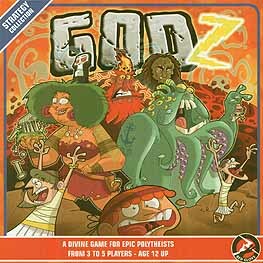 Lead your followers in epic, god-sized battles, and become the most powerful of the GodZ!